As long-time readers will know, I only write a small portion of the words used in the audio pieces here. That’s not because I couldn’t—Dave and I have written poetry for about as long as we’ve written music—but because the Parlando Project is, in part, an exercise in how I react to and present “Other People’s Stories.” Trying to get inside the experience of other writers, trying to find a way to inhabit their words, this is one of the objects of what I do. I’m not against self-expression exactly. If I was, I’d have fewer other writer’s selves to express after all, but the nature of what one artist draws out of someone else’s expression is interesting to me. I wrote the words to today’s piece, “Old Michaelmas Day,” thanks to a blog post on another blog I follow. Earlier this month, I was struggling with a more complex musical part for Hardy’s “The Self-Unseen” when I took a break and read a new post over at the Daze and Weekes blog. It’s there that I read of a marvelous British Isles folk tradition having to do with Saint Michael’s Day (Michaelmas). 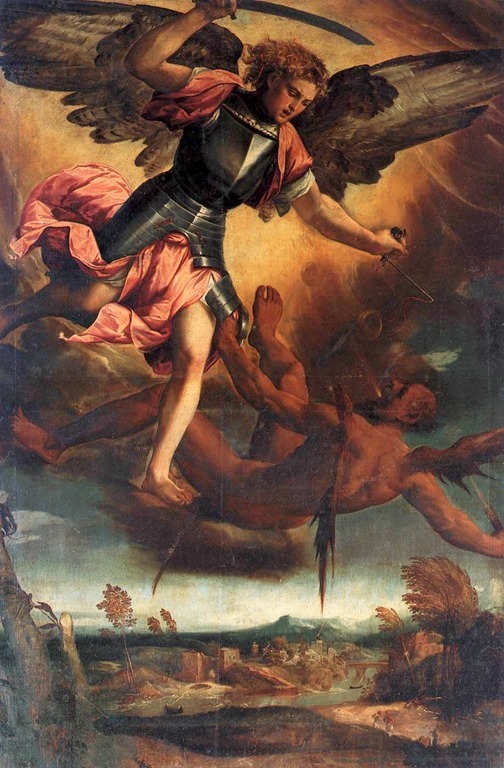 Michael is one of the Archangels, the warrior among them who cast a rebellious Satan out of heaven. Since he’s an immortal angel, he has no birth or martyrdom day to celebrate, so his day on the old church calendar is supposed to be the very day he cast Satan down. Let up Mike, I’ve had enough! Just don’t let me land on any prickly bushes OK? But here’s where the myth gets interesting for me. In the Northern Hemisphere his day (September 30th on the Julien calendar, and either October 10 or 11th, depending on who’s counting, on the modern calendar) comes in the harvest season. In the British Isles variation on this, falling Satan lands on a prickly blackberry bush, and so mad at the prickles, or whole casting-down thing, he spits and or pees on the blackberries. And so, after Michaelmas, blackberries are no longer fit to be eaten, on the grounds of folklore, and all this expectoration and micturition. It just so happens that my friend, and the better poet, Kevin Fitzpatrick has a great poem about blackberry harvesting, and in that poem Kevin refers back to a poem by Seamus Heaneym, also about blackberry picking. So, from another blogger’s post, about another country’s folk-legend with the Devil’s happenstance landing, and my memory of a friend’s poem, adding perhaps even a bit of Thomas Hardy or Seamus Heaney stuck in my ear, this piece was born. In such a way, “Other People’s Stories” gets honored, even in the breach. The Thomas Hardy piece got done, though I decided to go with a simpler folkie musical accompaniment there. For “Old Michaelmas Day” the music is more complicated, as it uses my more modern orchestral/electronic instrument ideas. The music consists of a conventional drum set and a series of staccato violin notes, bookended with some low, sustained piano notes in the left channel with higher register Rhodes electric piano on the right. And then, sweeping through it all, a close cluster of orchestra sounds, treated with constant and fast audio manipulation so that it sounds almost like a strange organ stop. As with many of my modern orchestra/electronic pieces it sounds like it uses “loops,” but also like many of my pieces, it doesn’t. Loops are easy to create and compose with using computers: import or create a few bars of a motif, and just tell the software to repeat as necessary. But in “Old Michaelmas Day” all the notes are played, with differences in timing, and with the notes themselves changing (albeit, there are only a small number of pitches used in the keyboard and violin parts). This piece is another short one, so even if you don’t usually listen to music in this mode, give it a try, as even if you don’t like it, it won’t bother you very long. The player gadget appears at the end of this post. If you do like it, please help spread the word about the things we’re doing here, particularly on your blog, or on Facebook or other social media.